The Albert Fall Mansion in El Paso is one of 12 sites that Preservation Texas, Inc. has named to its tenth anniversary retrospective list of Texas’ Most Endangered Historic Places. Originally named to the 2004 list of Texas’Most Endangered Historic Places, it is designated as a saved site on the 2013 list. Preservation Texas officials announced the selections on the steps of the Texas State Capitol on Preservation Day, February 20. The annual announcement is part of Preservation Day activities organized by Preservation Texas. Advocates from all over the state come to participate in informational sessions, meet with legislators at the Capitol and get an in depth look at lessons to be learned from the sites named to the list. he served from 1921-1923 and was convicted of accepting a bribe during the Teapot Dome scandal. The house is significant because of the connection to Fall’s life, and its age and architectural design. 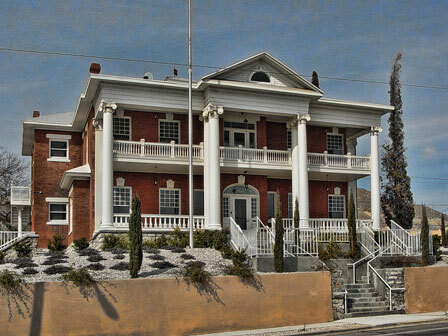 Community organizations including the Historic Landmark Commission of the City of El Paso, El Paso Preservation Alliance and the El Paso County Historical Commission worked with the City’s Historic Preservation Officer and kept the community’s attention on the structure. As a result, the City of El Paso acquired the house by eminent domain, buying the property from the owner. The house will be leased for use by the Texas Tech University Health Sciences Center-El Paso. It is a great example of community collaboration using an ordinance as intended to save a significant property.